Mauro Icardi and his wife and agent Wanda Nara held a "cordial" meeting with Inter CEO Giuseppe Marotta as they seek a resolution to the saga surrounding the striker. Icardi has been left out of Inter's last five matchday squads after being stripped of the captaincy last month, and speculation over his future at San Siro persists. The Argentina international posted a lengthy statement on Instagram last week in which he questioned whether Inter's decision-makers were showing him respect, although he professed his love for the club and claimed to have previously rejected several significant offers. 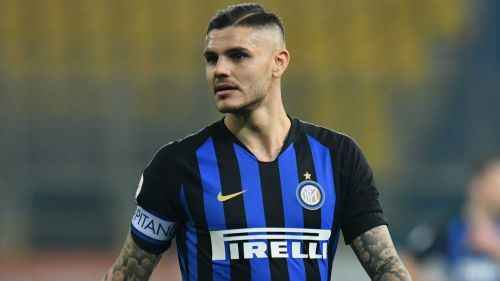 Despite his affection for the Nerazzurri, Icardi and Inter have been unable to reach an agreement over a new contract, raising the likelihood that he has played his last game for the club. Nara recently dismissed a report in Marca that her outspoken nature put Real Madrid off a move for Icardi, who now appears to have at least taken a step towards resolving the situation. In a post on their Twitter account, the club wrote: "Inter's Sport CEO Giuseppe Marotta today held a cordial meeting with Mauro Icardi and Wanda Nara in search of a solution to satisfy the best interests of all involved." Icardi's deal, which reportedly contains a relatively low release clause of €110million, has two and a half years left to run. He has scored 15 goals in 28 appearances in all competitions this season but has not played since the 1-0 Serie A win over Parma on February 9. The former Sampdoria striker complained of knee pain after missing the Europa League win at Rapid Vienna, with head coach Luciano Spalletti saying Icardi had withdrawn from the squad himself before Inter issued a statement in which they stated medical tests could not identify any specific problem. Inter lost 2-1 to Cagliari on Friday in Icardi's absence and are fourth in Serie A, a point behind rivals AC Milan in third and three clear of fifth-placed Roma.